For the past year or so, our Nation has been debating minimum wages. Unfortunately, as far as I can tell, arguments on both sides are utterly indefensible because they are based primarily on emotion and full of conjecture and anecdotes. To be sure, this same debate comes about every five to ten years and it will continue to return because the federal minimum wage is an arbitrary number. I’m a mathematician and we don’t like solving the same problem over and over again. Nor do we like making decisions without a repeatable logical basis. So, I wish to put an end to the bickering. I propose the following definition. Minimum Wage: the lowest hourly wage such that the wage earner is not dependent on federal assistance programs. So, how does that help us? Let’s consider a single-income family of four. According to HHS, the family bread-winner needs to make $24,600. By my definition, the minimum wage is how much he or she needs to make per hour to earn $24,600 per year. That is, minimum wage should be $24,600 / (# weeks per year x # hours per week). For simplicity, let’s suppose the bread-winner works 50 weeks per year (i.e., gets two weeks of vacation) and works 40 hours per week. 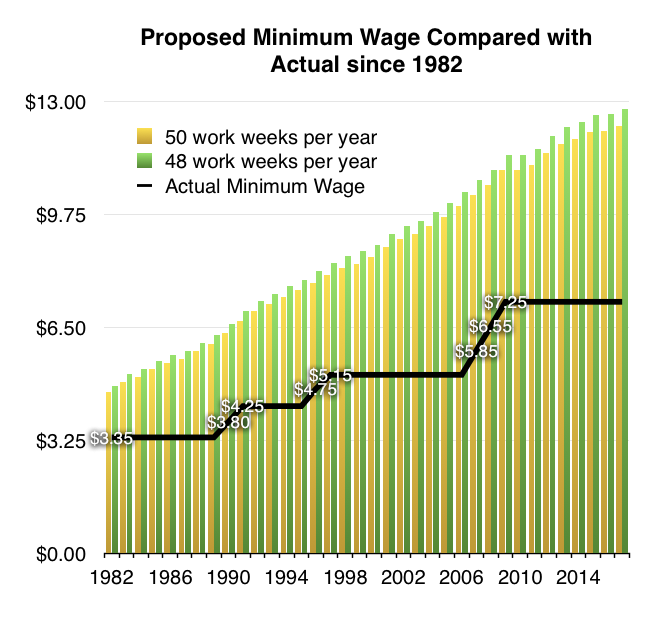 In this case, the minimum wage for a single-income family of four is 24600 / (50 x 40) = 24600 / 2000 = $12.30 per hour. Even if the bread-winner takes a month (four weeks) of vacation, the hourly wage only goes up to $12.81. On the other hand, the $15 that is becoming popular now is equivalent to our bread winner taking 11 weeks of vacation per year! Now, how can we poke holes in my rationale? Here are a few arguments. 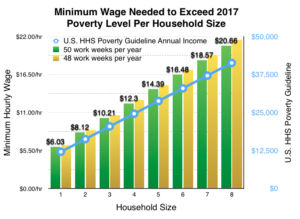 You could say that this wage is too high arguing that the guidelines give a household income and that we should expect people at the poverty level to have dual-income households. However, in a dual-income, four-person, minimum wage-earning household, most of that second income will be going to childcare. So, given that and the research that suggests the benefits of having a stay-at-home parent, let’s keep our family single-income. You could say that this gives a wage that is too low suggesting that we should set the minimum wage for larger households. Moving to a 5-member household takes the minimum wage to $14.39 and $14.99 for 50 and 40 weeks, respectively. That’s closer to but not quite $15.00. However, I would also point out that the U.S. Census Bureau estimates that 25% of U.S. households are only one person and that the average size of households has declined to around 3 people (or $10.21 per hour by my proposal). 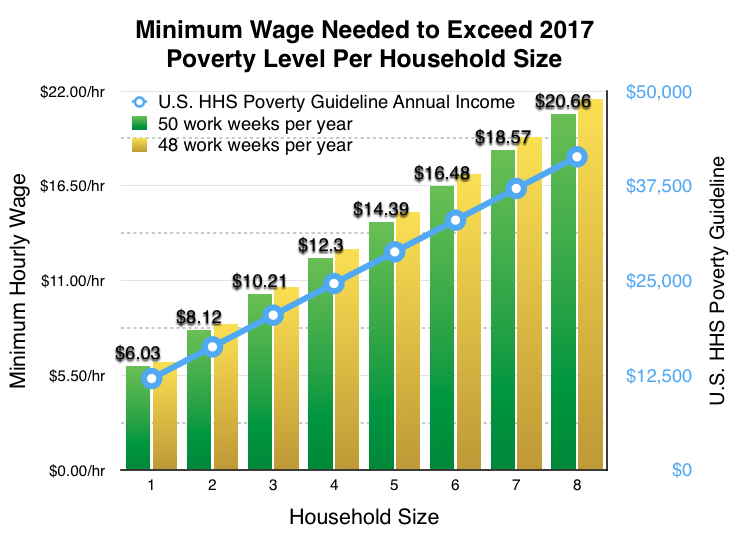 Incidentally, at the current $7.25 per hour, the U.S. minimum wage is pegged at supporting a household of under 2 people. Perhaps minimum wage should aim to put people above the poverty level. That might be the thinking that’s led to the $15/hr cry. If we go down that route, that’s fine but then we need to decide how far above the poverty level the minimum wage should bring our family. I’m not particularly wed to the HHS Poverty Guidelines. Just give me a concrete target that the government can set to standardize an annual calculation. However, if that number isn’t the poverty guideline, which sets the standard for federal aid, then why do we have the guideline at all? I’m sure there are more pokes, but as we revisit the minimum wage issue yet again, what’s becoming clearer to me is that the actual wage is arbitrary. The minimum wage only increases when people notice how low it is and Congress adds in a gradual step but the wage quickly gets outpaced by the growth of our economy and minimum wage earners are left to fend for themselves. 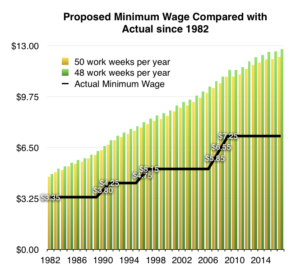 To see how egregious our current arbitrary process is, all we need to do is compare this proposed minimum wage with the actual minimum wage. In doing so, we see that the jumps in minimum wage come nowhere near to closing the gap between what people earn and what they need to earn to stay out of poverty. In fact, the gap has gotten larger and larger since 1982. Minimum Wages Need Not Be Arbitrary! As I’ve described here, if a wage is to be set, the government can set a wage consistent with federal poverty guidelines and, as I described previously, the government can adjust that wage consistent with federal cost of living calculations for each region of the country. What we have now is an example of lobbyists and government officials creating new arbitrary statutes and standards rather than applying ones that already exist.